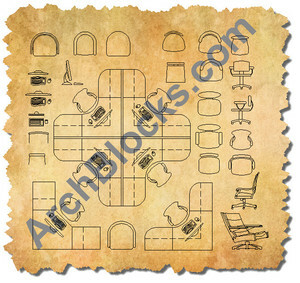 AutoCAD Blocks for Office Furniture and Dental Office Equipment. This is a very nice set of CAD block libraries for office furniture and AutoCAD dental office equipment. These CAD blocks are drawn to real world sizes so you can drag and drop them right into your CAD floorplan and space plan project drawings. They are all drawn on layer Zero and will change to the color and linetype of the current layer they are inserted on in AutoCAD. These CAD office furniture and AutoCAD dental office equipment blocks can be downloaded NOW! 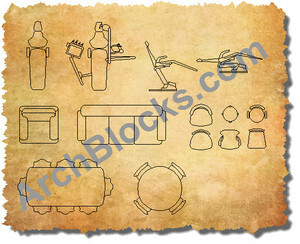 All the ArchBlocks.com products have a 100% satisfaction guarantee!